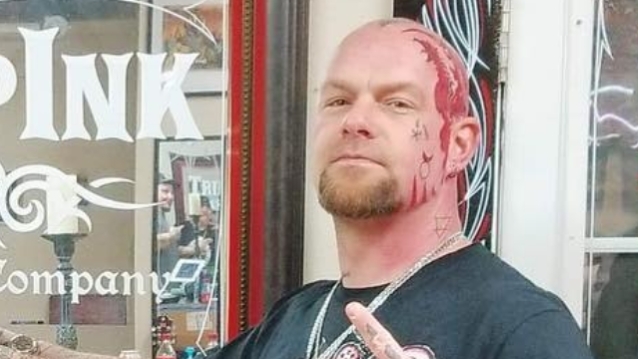 FIVE FINGER DEATH PUNCH frontman Ivan Moody celebrated his first year of sobriety this past weekend by getting a head/face tattoo of a phoenix rising from the ashes. Moody took to his Instagram earlier today to post several short videos and photos of him getting inked at Trip Ink in Las Vegas, Nevada. On Sunday, Moody's FIVE FINGER bandmate, bassist Chris Kael, congratulated the singer, writing, "Join me in celebrating @ivanmoody today on his One Year Sober Birthday! Roughly 75 percent of those who start the path to sobriety don't make it a full year." Kael added: "I've seen firsthand the work that Ivan has done through 365 consecutive days to get himself to this HUGE milestone. I've seen the amazing, positive changes in him over this past year that have gotten closer and closer to the man we all knew he could be. I'm proud of you, my friend. As are countless people you have inspired along the way." Kael himself celebrated a year of sobriety in February. Moody told The Pulse Of Radio a while back that finding sobriety gave him a whole new lease on life. "I'm just so happy to be away from the clutches of it," he said. "I just didn't want my legacy to be that of a few others that I don't even have to name, where I was controlled by a substance, or a liquid for that matter. My life is too precious to me. It's night and day, man, and I'm really, really proud to be sober."